Here’s How to Know the Difference Between Miss, Mrs., and Ms.
Miss, Mrs., and Ms. are not interchangeable terms. Choosing the wrong title can cause offense, so it’s important to know the difference between the three titles. The guide below will describe how the titles Miss, Mrs., and Ms. have been used traditionally—but remember, if someone tells you they prefer a particular title, that’s the one you should use to address them. “Miss,” when attached to a name, is a title of respect for an unmarried woman. You can use it by itself as a term of address or combine it with a surname, a descriptor of a prominent characteristic, or something she represents. Miss Penelope Edwards is the new nursery school teacher. Demi-Leigh Nel-Peters is Miss Universe 2017 . Excuse me, Miss. You dropped your change purse. Well, aren’t you little Miss Traveler ? Typically, in a business setting, you would use “Miss” along with an unmarried female’s last name. Don’t worry if you don’t know the woman’s last name; pausing after Miss often prompts the woman to supply it to you. Usually, it’s polite to continue using the formal title until the addressee invites you to use her first name. Make sure to use “Miss” for unmarried women you don’t know well or who hold positions of authority, such as teachers or supervisors. Note: In some geographical regions, “Miss” appears with a first name. People use it as a sign of respect or affection for women. When used with young girls, a chastisement may accompany it. Thanks for the invitation, Miss Janice . You are a great neighbor! Miss Tamara Jasmine Hunter ! Put that toy down and clean your room right now. “Mrs.” is a title of respect for a married or widowed woman. As in the case of Miss, it appears with names and characteristics. Sometimes the title includes her husband’s first and last name rather than her own, especially for written correspondence or when the wife’s name is unknown; this practices is becoming far less common than it was in the past, however. Address the envelope to Mrs. Donald Belmont . How do you use “Mrs.”? At work, when addressing married women, and when speaking to women in a position of authority, use “Mrs.” along with the married female’s last name. Again, wait for an invitation to drop the formal title before using a woman’s first name. Mrs. Jones is an amazing electrical engineer. What if you don’t know whether someone is married or not? People began to use “Ms.” in the 1950s as a title of respect. Unlike “Miss” or “Mrs.”, it doesn’t indicate a woman’s marital status. 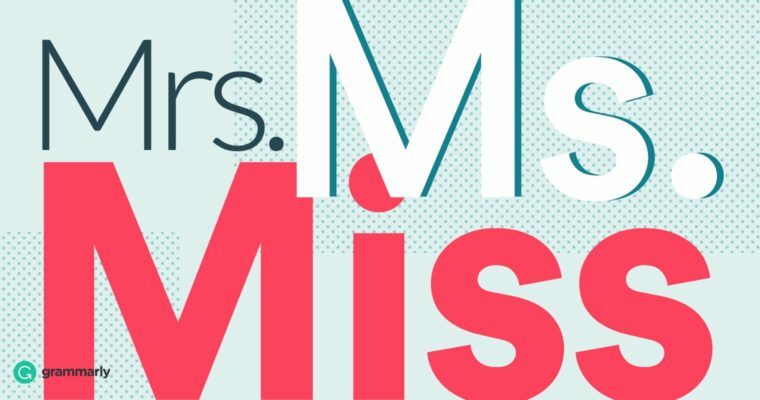 The title became popular during the women’s movement of the 1970s because “Ms.” seemed a suitable equivalent of “Mister,” a title of respect for both unmarried and married men. Both “Miss” and “Ms.” apply to women who are unmarried or whose marital status is unknown. Which you choose depends on the preference of the woman. Interestingly, some newspaper editors avoid the issue by omitting titles and instead referring to men and women by their full names. However, newspapers usually retain the titles if they appear in a quote. Prince Harry has said he knew his bride-to-be Meghan Markle was “the one” from the moment they met, as the couple made their first public appearance since the announcement of their engagement. ”There are simply not enough good things I can say about Mrs. Wendy Hassemer, ” said Cory Chavez, one of her former students at Pojoaque Valley High School, where she taught for 13 years and served as a drama club sponsor, school play director, and all-around mentor. Apply the same rules as you would for “Miss” and “Mrs.” However, there are differences in pronunciation. How you pronounce these titles depends on where you live. Let’s start with the easiest. “Miss” rhymes with “this” in all geographical regions. However, “Mrs.” may sound like “mis-iz” or “mis-is” in the North or North Midland areas of the United States. On the other hand, Southerners may pronounce “Mrs.” as “miz-iz” or “miz.” “Miz” is also the pronunciation of “Ms.” Therefore, in the South, “Mrs.” and “Ms.” may sound identical. While most people use titles such as “Miss”, “Mrs.”, or “Ms.” to show respect, you can risk offense if you don’t use them correctly. Therefore, invest a few moments to become familiar with how these titles work. If you think before you speak, and defer to women’s preferences as to how you should address them, you will be able to build respectful relationships with the women in your life.